On Wednesday, a State district Judge exonerated 44-year-old John Earl Nolley for the 1996 murder of Sharon McLane. 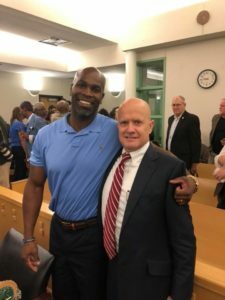 Nolley was released after 19 years in prison in May 2016 but was not declared innocent until a Texas judge signed an order following the emergence of new evidence. The order qualifies Nolley for state compensation. Nolley’s conviction was based on two jailhouse snitches and circumstantial evidence. Gary Medlin, an attorney at Medlin Law, worked with The Innocence Project to call key evidence into question. The integrity unit at the organization revisited files on informants and was able to discredit the informants, confirming they lied in their testimonies. The Innocence Project also used advanced forensic technology to unlink Nolley from the physical evidence. Louis Sturns, a State District judge, apologized to Nolley for the 21 years he lost from this wrongful conviction, which includes 19 years in jail in addition to two years of waiting for his name to be cleared. “I’ve always believed he was innocent,” said Attorney Gary Medlin said. Medlin was Nolley’s original defense attorney in 1997 and 1998. “It was the hardest thing to look at him after he had been convicted by a jury. Most people are angry — looking for someone to blame, he just cried.” Medlin added. Medlin law urges those who believe they were wrongfully arrested to reach out to them for legal support. With the proper defense strategies and research, attorneys at Medlin law may be able to help. In over 32 years of criminal law practice, Gary Medlin has handled thousands of criminal matters. His experience practicing both sides of Texas state and federal criminal law cases offers a significant advantage to his clients.